Bring on the flavor and ditch the fat with our super-quick, no-cook, 5-Minute Blender Enchilada Sauce with truly authentic taste! With aromatic spices, tomatoes, and a splash of broth you get to create a new go-to staple. We’ve come to appreciate this recipe much more than our former favorite store-bought version. And the best part of all is that it’s incredibly easy to whip up an impressive tasting batch! 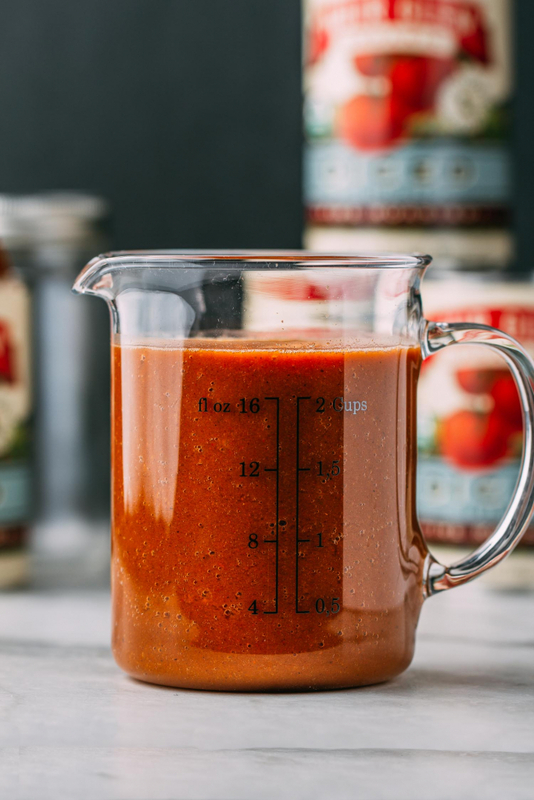 Making this enchilada sauce for the first time will become a pleasant memory that will change the way you cook! When we first threw this in the blender, we thought of the first time we tried our hand at making oil-free hummus at home. There’s this palatable “ah-ha moment” when you realize how easy it is to make your enchilada sauce. And you soon recognize how delicious it tastes. But then it hit you it hits you, and you understand, clearly, how ridiculous you’ve been for settling for store-bought for all of these years. The depth of emotion in a cook’s kitchen is nothing short of spectacular! 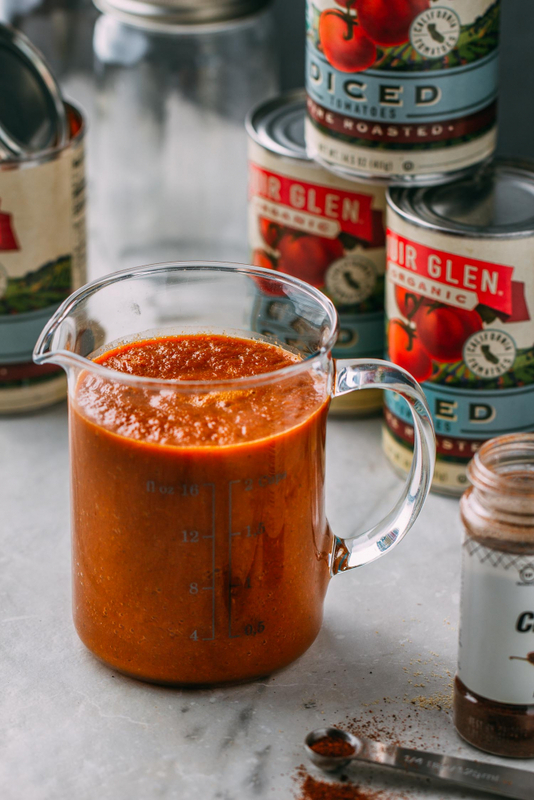 Ever since we started making enchilada sauce at home, we haven’t purchased a single can of the sauce since. It’s much cheaper to mix fresh sauce at home. But equally important, it tastes better when it’s homemade. Oh, and the other benefit of making this oil-free sauce is that you know what’s in it! We created our Mexican Blender Enchilada Sauce recipe when we were writing the steps for our Enchilada Lentil Rice. While testing that recipe we found we’d stumbled upon a handy sauce to use in so many other dishes. By adding veggie broth to the spices in our satisfying rice dish, we created a finger-licking sauce that made us wish for more! And that’s the story of how this recipe was born. We love it when ingredients and solutions come together organically. It’s a lot like love, and for sure it’s filled with passion. If you like, you can simmer this sauce on the stove to allow it to cook down and thicken just a bit. Depending on how you use it, it’s fabulous raw or cooked! We have big plans to try our no-cook 5-Minute Blender Enchilada Sauce in all sorts of new recipes. We’re thinking a gluten-free taco pizza sounds like a perfect way to use the sauce when it’s thickened up. As is, we love using it to make plant-based veggie enchiladas – that recipe is in the works! And of course, we adore it in the recipe where it originated, our satisfying one-bowl meal, 1-Pot Enchilada Lentil Rice. 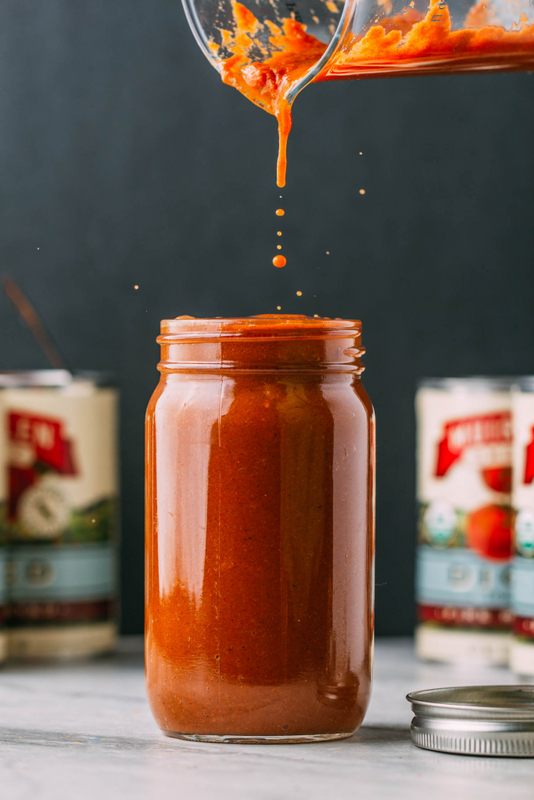 An especially helpful aspect of this sauce is that it stores well in the fridge for about a week in an airtight container, such as a mason jar. We use these jars for everything! Mexican Blender Enchilada Sauce also freezes well which makes it ideal for big batch meal prepping. There’s nothing quite like knowing you already have a sauce all ready to go and waiting when dinner needs to get on the table quickly. 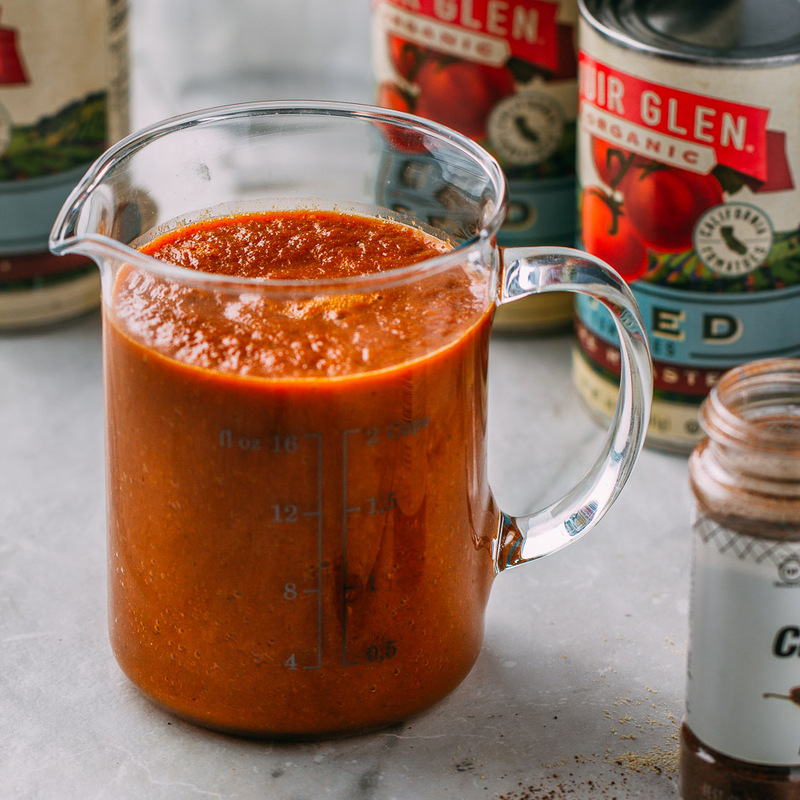 When you make this 5-Minute Blender Enchilada Sauce, you’ll note that we call for miso. We like to use miso as a savory flavoring in place of salt when the recipe allows. If you don’t have miso on hand, it’s possible to make your enchilada sauce without it. But do note that we do opt to use miso for both flavor and health benefits. According to this video, using miso as a seasoning is more received better by the stomach than straight salt. When you try this recipe and fall in love with it, or if a question comes to mind, leave us a comment! We love to hear from you! And when you share your thoughts about a recipe you’ve enjoyed, you help others who are considering trying it too. We don’t mean to sound repetitive, but we must express our appreciation to each of you who faithfully read our recipe posts. We also want to say a special thank you to those who Pin and share our recipes on Facebook. 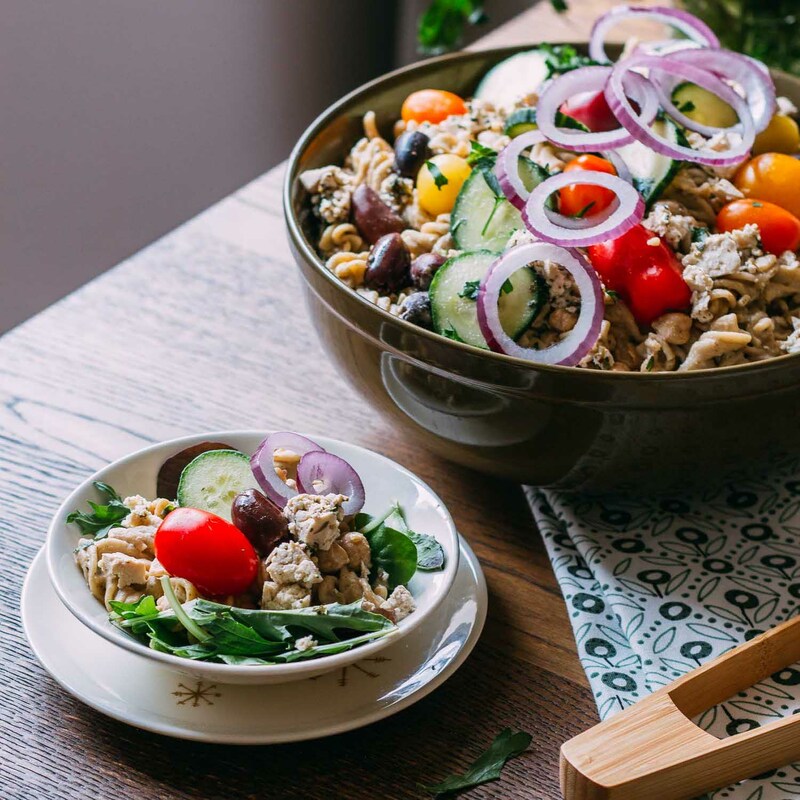 These two venues, along with all of your other social media hot spots, are terrific ways to help convey the news that plant-based vegan food tastes GOOD! 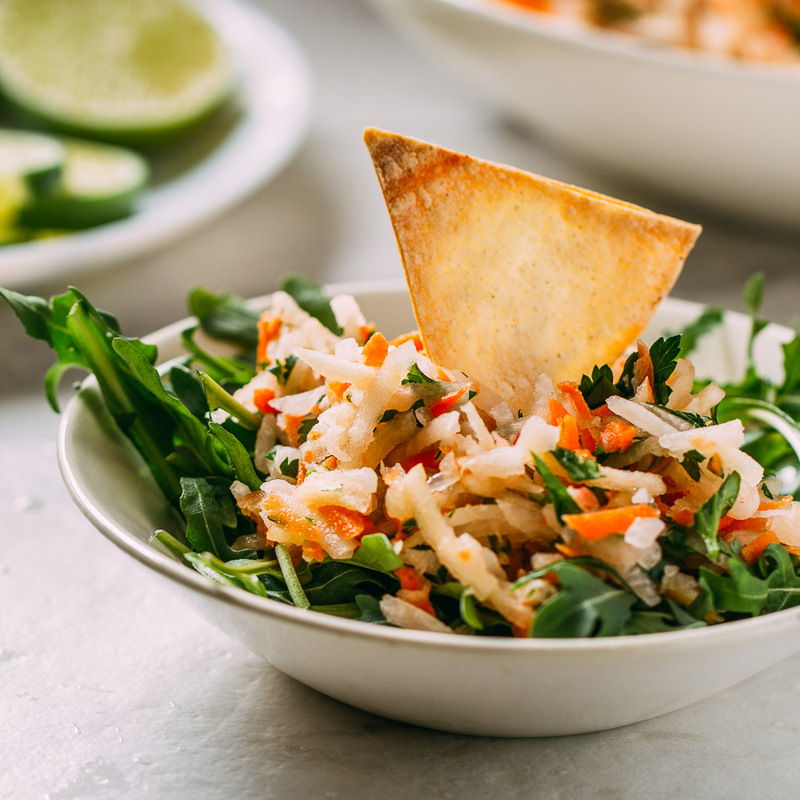 Each time we use this delightfully easy sauce we end up topping whatever deliciousness we’ve created with a sprinkle of fresh cilantro, slices of avocado, a dollop of plant-based sour cream or plain yogurt, and a scoop of spicy fresh salsa! This quick and easy sauce is a no-cook, oil-free, gluten-free, vegan, game-changer. Nobody has so little time that they cannot make and enjoy this sauce. And you’re going to love the fact that you are building a base for so many recipes that begin with whole food plant-based ingredients that are additive, preservative and filler free! Use your homemade, oil-free and gluten-free enchilada sauce in everything from tortilla soup, enchiladas, and of course, our delicious 1-Pot Enchilada Lentil Rice! The following combined ingredients make about 32 oz or 4 cups of sauce depending on how much broth or water you decide to use. We divided the 4 cups of sauce into eight servings of 1/2 cup each, which is a generous serving size. 1 to 2 cups of vegetable broth or water - We use 2 cups of organic vegetable broth to end up with 4 cups of finished sauce. Less liquid will create a zestier sauce. 1 tbsp of miso - You can sub in salt here, but the miso does add another little level of flavor that we appreciate in this sauce. an optional dash of salt - We like to use pink Himalayan sea salt but whatever salt you have on hand will do. 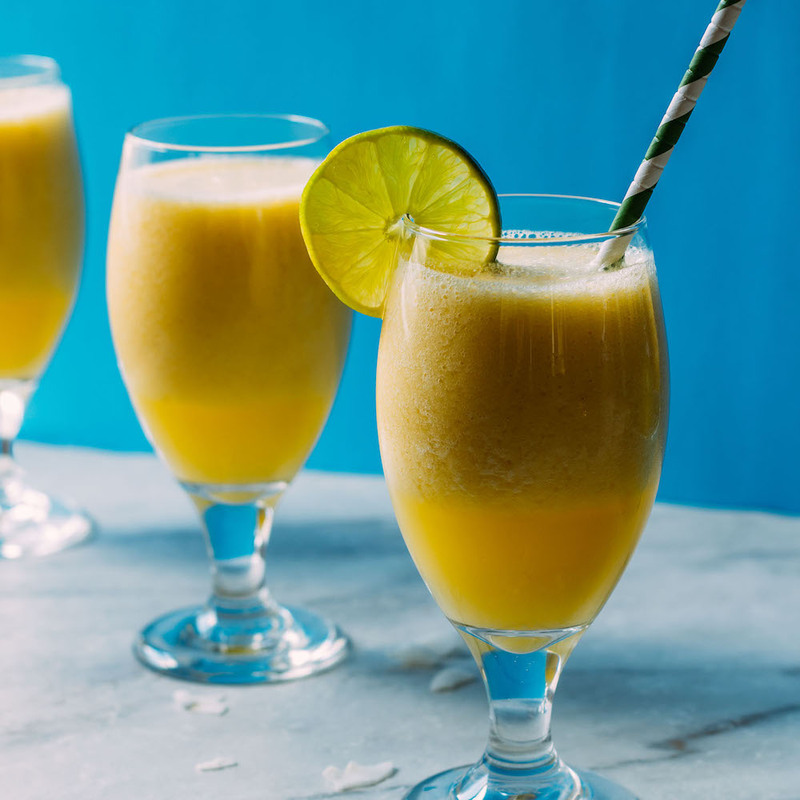 Place all of the ingredients in a high-speed blender and combine until smooth. Taste and season according to your liking. Use your homemade, oil-free and gluten-free enchilada sauce in everything from tortilla soup, enchiladas, and of course, our delicious 1-Pot Enchilada Lentil Rice! This sauce will keep well in the fridge for up to about a week in an airtight sealed container and will freeze well and stay ready-to-go for months!